Let’s be real. Staying organized is hard, add a kid to that equation, it’s nearly impossible. So, how do mom’s do it every day? Even more, how do mom’s who are going to school do it?! Learning just a few smart tips to have everything straightened out in everyday life can help a mom out immensely. The best way to get things accomplished is having that ability to keep it all together. 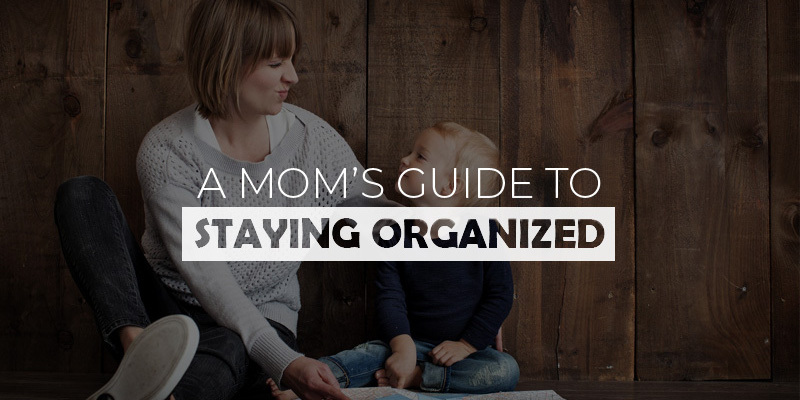 So, here’s a mom’s guide to staying organized. The main points will involve a planning center, routine, and ways to keep a clean, tidy home. You may have seen them in schools, churches, or even your workplace. That’s right; I’m talking about a planning center. If you aren’t aware of what a planning center is, don’t fret. A planning center is one central place to manage your busy home life. It’s a place to keep and put your mail. Most importantly, it’s where you can lay out family scheduling, meal planning, and what your doing for the week. It’s the one place everyone can see what’s going on, what’s for dinner that week, and what’s coming up. A planning center is a great way to keep your family informed. Another great way for your family to keep a tight schedule is creating a routine. For example, every Sunday could be a meal preparation day for the week to come. Having your family help cook food for the week to come creates bonding time and makes it easier on you. Not only can you get things accomplished you are also teaching good productive habits by getting things ready beforehand. It also makes things easier in the long run. With routine comes personal time. When you stick to a flowing routine, you can make more time for yourself. A great example of this is having crockpot night. Let’s just say that every Saturday is crockpot night. Now you know on Saturdays that while your dinner takes three hours to cook, you have three hours of free time. Not only did you create an hour with your routine crockpot nights, but now your home will smell amazing all day long. Now that you have a planning center and a routine the next thing you need is an organized home. Have you ever tried to put something away and didn’t know what spot to put it in? I know I have. The only thing worse than having a cluttered home is not knowing where to put things. Or even worse, not being able to find something important. Having a clutter-free home is crucial to one’s sanity. The secret to maintaining a tidy home is to have a spot for everything that you need. Donate things you don’t wear or use anymore. The trick is to get rid of all of the clutter. Also, create a ten or fifteen-minute cleaning habit every day. Or, if you don’t have ten or fifteen minutes a day have a day out of the week that you can dedicate to cleaning your home.